Thanks for the excellent service. We reinstalled the motor and it worked great. 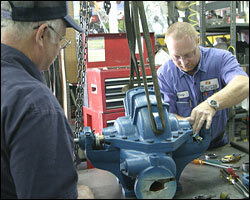 Our goal is to act as a one-stop shop for your entire range of industrial repair needs. Our comprehensive capabilities and test equipment, coupled with our broad range of technician talent, will enable TigerTek to resolve your toughest maintenance problems. We can send teams of technicians on-site to perform major or minor field service projects at your plant.